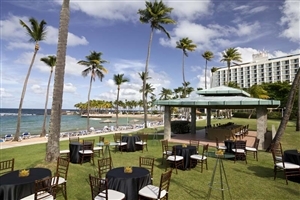 The Caribe Hilton sits in a prime location between historic Old San Juan and the Condado area, providing guests with easy access to many of the surrounding attractions. 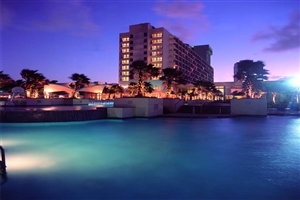 The hotel itself sits amongst lush tropical gardens on an exclusive peninsula and offers a wide selection of impressive accommodation as well as facilities that are suitable for all the family. 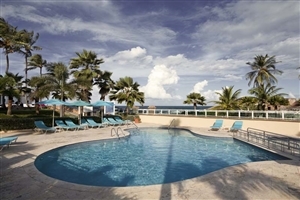 With a secluded beach on which to relax, you’re sure to enjoy the chance to spend time at this popular hotel. 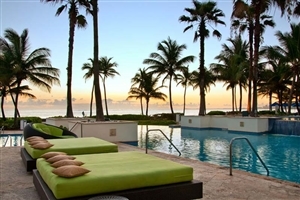 Relax at leisure with a break in the Caribe Hilton, a four star hotel that sits on an exclusive peninsula close to Old San Juan. 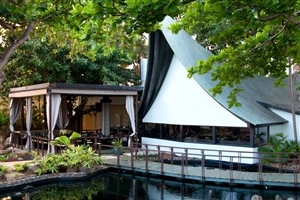 Sitting amongst 17 acres of tropical gardens, the hotel offers a range of stylish accommodation options across more than 800 rooms, which are perfect for couples and families alike. A secluded beach is just one option for those who want to relax, with a popular spa also on site to help leave you refreshed after your time away from home. 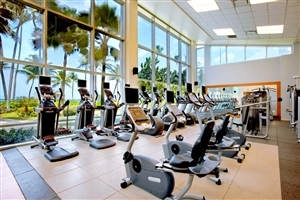 Facilities for all the family only serve to enhance the holiday experience. 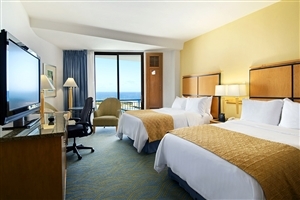 One King Bed Ocean View rooms provide guests with panoramic ocean views from your own private balcony. Alongside the king sized bedroom, there is also an impressive en-suite bathroom; some of which are adorned with marble and include a walk-in shower. There is also a desk and easy chair. The One King Bed with Balcony rooms feature a king size bed as well as a desk and easy chair, alongside your impressively styled bathroom. A private balcony provides the opportunity to embrace the views outdoors. 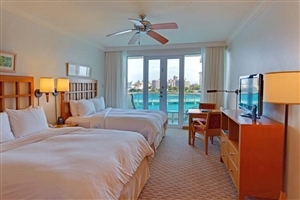 The Two Double Beds Ocean View rooms include two double beds alongside a desk and easy chair. The impressive bathroom comes complete with Peter Thomas Roth bath products and some come adorned with marble and a walk-in shower. The Two Double Beds with Balcony rooms feature stunning ocean views from your own private balcony and come with two double beds, a desk, easy chair and well appointed bathroom. The Two Bedroom Presidential Suite features two bedrooms, one of which comes with a king size bed and the other with two doubles. 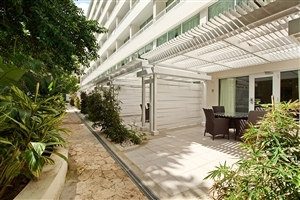 Both bedrooms feature en-suite facilities, whilst there is also a living/dining area, a kitchen and a large balcony. 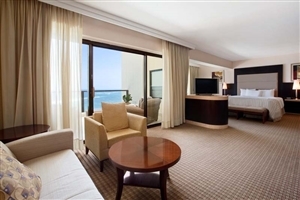 The Honeymoon Suite Ocean View is spread across two levels and includes a single bedroom with a king size bed. There is also a spacious living/dining area as well as two private terraces where you can also relax in your own private whirlpool. The bathroom features both a bath and shower. 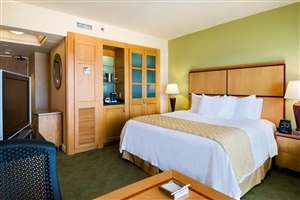 The San Geronimo Suite comes with a king sized bed and offers stunning views across the ocean from a private balcony. There is also a stylish living/dining area, a kitchen area and an impressive bathroom. 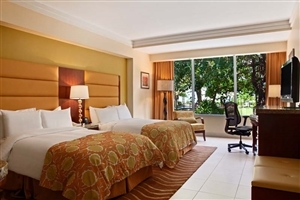 The One Bedroom Suite with Garden View offers views across the tropical gardens from your private balcony. 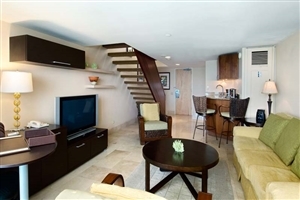 The suite comes with a king size bed as well as a sofa bed within the living area and no fewer than two bathrooms. Junior Suites are available with either garden or city views, and come complete with a king size bed in the bedroom and a sofa bed within the spacious living area. There is also a well appointed bathroom that comes complete with Thomas Roth bath products. 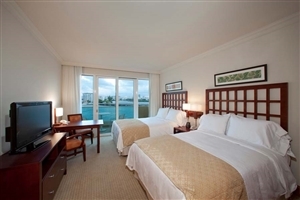 The Two Bedroom Suite with Ocean View features one bedroom with a king size bed and one with two doubles – both of which feature en-suite facilities. There are also separate living and dining areas as well as a kitchen, and two terraces that provide the opportunity to take in the stunning ocean views. 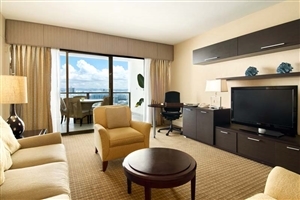 The Two Bedroom Suite with Lagoon View offers impressive views over the Condado Lagoon from your private balcony. The suite features a king size bed, two doubles and a sofa bed, a stylish bathroom and a living area. The Villa Ocean View is the perfect option for couples looking for a break away from home and feature views out across the Atlantic Ocean. 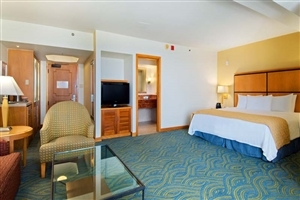 The room comes complete with a king size bed, a marble bathroom with separate shower and bath and a working area. The Villa Studio Ocean View features two queen sized beds as well as a stylish bathroom with wall-to-ceiling marble and a separate shower and bath. There is also a kitchenette, which provides the option to either dine in, or head out for food. The One Bedroom Villa comes with either a king size bed or two doubles, alongside a living/dining area, a kitchen and an impressive marble bathroom with both shower and bath. The living area can be used to provide additional sleeping space, meaning the villa can accommodate up to six guests. The luxurious Two Bedroom Villa Suite can sleep up to eight people, with a king bedroom (complete with marble en-suite), a second bedroom with two queen sized beds and the ability to accommodate more guests in the spacious living area. There is also a dining area and a fully equipped kitchen, as well as a second bathroom. Il Giardino La Trattoria: Enjoy a taste of Italy whilst relaxing in the Caribbean, with a range of pasta and antipasto being served alongside a collection of more than 150 top class wines. 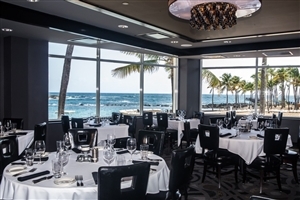 Morton’s The Steakhouse: Enjoy stunning views across the ocean as you dine on the highest quality cuts of meat and tasty seafood. Lemongrass Pan Asian Latino: Ideal for those with an adventurous palate, Lemongrass offers a range of interesting treats that fuse Asian and Puerto Rican flavours together. 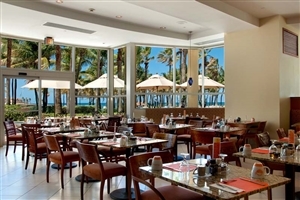 Palmeras: Open daily for breakfast with views over the Atlantic Ocean. Quiznos Sub: Grabd a quick flatbread, wrap or sub inspired by top chefs. 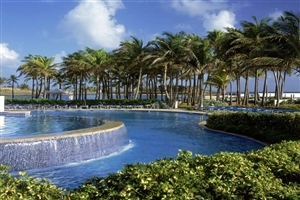 Atlantico Pool Bar & Grill: The poolside grill offers a range of snacks that can be enjoyed throughout the day. Caribar: Alongside tasty cocktails, sample a range of light bites from the tapas menu as you look out across the ocean.